Attractive villa situated on the modern urbanisation of Cap Artruix. Built on a level the villa has three double bedrooms, two bathrooms (one en suite), lounge with wifi-internet connection, DVD player, satellite TV (free channels only) and a fully equipped kitchen. Sleeping 7 people. 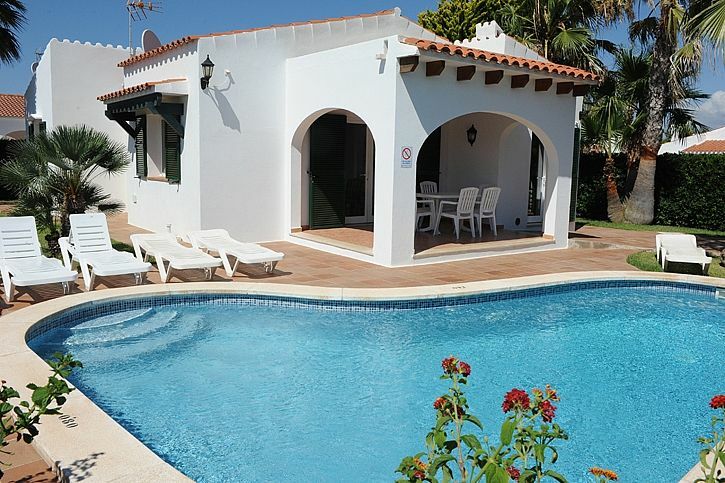 The villa has a garden, a private pool and a lovely barbecue area. Weekly pool and garden maintenance provided. Shops and restaurants close by. The beach of Cala'n Bosch is 20 minutes walking. Only ten minutes driving from the old capital Ciutadella. Ideal for families or friends who want to enjoy a wonderful and relaxing holidays. 2 bathrooms ((1 ensuite) with bath, basin, bidet, wc. There is a confortable lounge/dinning room with sofa, dining table, chairs, TV, DVD player, satellite TV and access to the covered terrace and pool. Kitchen with cooker, oven, hob, microwave, fridge/freezer, washing machine, toaster, electric kettle, cutlery, dinner service and cooking equipment. Notes on accommodation: No pets allowed. On departure day the villa must be vacated at 10.00 a.m. Outside: Private pool, underwater pool lighting, simple pool-side shower, Mediterranean plants. Garden furniture: a table, chairs, umbrella and sunbeds. Covered terrace and a buit barbecue. Outside lighting. Cleaning / Towels / Linen / Maid service: Sheets and towels (not beach towels) are provided and changed every week. The villa is cleaned before arrival and departure. Very spacious and well laid out property, well maintained and equipped. The Menorca bridlepath is very close by called Cami de Cavells for those who like to explore the island on foot or maybe mountain bike. The pool is superb, excellent to relax in when the weather is too hot. The owners are available if required and very helpful with assistance if they are called upon. In summary a great holiday location for the independent traveller. Thank you very much for your positive review. You are very nice people. We hope to see you again in the next furure. Lovely stay in a clean villa, great location,just a few minutes walk to the local well stocked supermarket. Short 15 minuets walk to the nearest beach and harbour. Especially loved the private pool which although was not heated, was not cold in September. Would love to go again. Thank you very much for you nice review. We hope to see you again in the next future. The villa was compact but large enough for the 4 of us. It was well equipped and had sufficient seating and sun beds. Bedding and towels were changed half way through our trip. Magdalena was very welcoming and within a couple of hours had replaced the broken fan. The pool was cleaned 3 times during our 10 day stay. The pool was very warm but not alarmed so be aware if you have small children. Our only criticism is that the beds were hard, but other than that, we had a lovely time. The villa is within walking distance of 3 small supermarkets, a couple of bars and restaurants. We had a car but the local bus runs regularly to Ciutadella where there are larger supermarkets and lots of bars, restaurants and shops. The villa is a 40 minute drive from the airport and 15 minutes from Ciutadella. A Perfectly situated family villa. We stayed at this villa with our family. 7 of us enjoyed playing around the pool, our ages ranged from 8 - 70.The villa is kept very clean with fresh towels & bedding delivered after 1 week. Everything you could possibly want on holiday is in the villa, washing machine, kettle, toaster, hairdryer, iron and microwave. The owner is very friendly and was there to meet us when we arrived. Bars, restaurants & Supermarkets just around the corner, with friendly staff. For a wider variation of bars and restaurants you can take a stroll down to the marina of Cala n Bosch, the older members of our family took the bus for 1 euro. The Bus stop is very close to villa. We would not hesitate to recommend this villa and in fact we are thinking of going back. We found the villa to be very well equipped and excellently clean. The welcome was very good and we would have no hesitation to recommending this villa for any family looking for an excellent base to enjoy Calan Bosch and the island of Menorca. Beaches are 25 minutes walk. Mahon airport is approximately 40 minutes drive by car. The town is 10 minutes by car. The resort is centred around a small marina, where boats can be hired. Here you have an extensive selection of shops, bars, restaurants and pubs. Medical centre and chemist. There is a bus service to and from the town. Booking Notes: A deposit of 25% is required at the time of booking. On departure day the villa must be vacated at 10.00am.